Hi everyone! 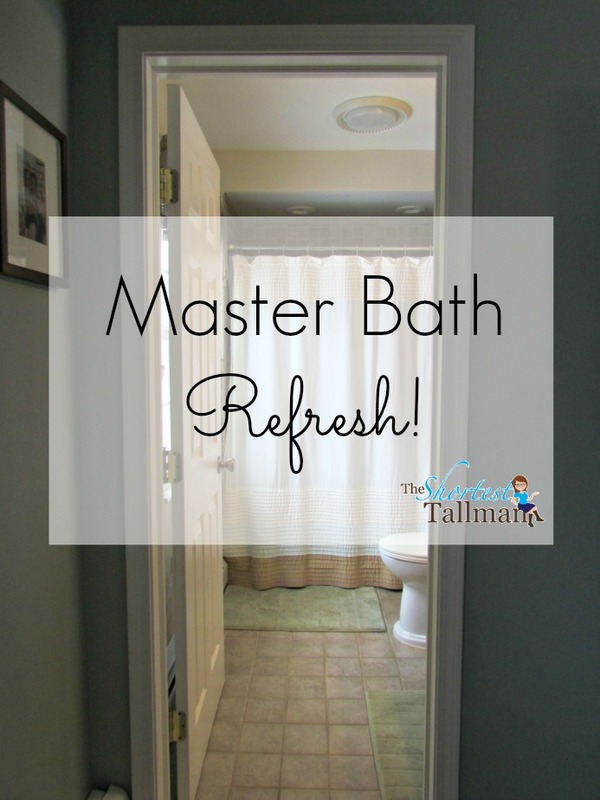 I’m continuing on with my sharing of little wrap-ups of various home improvement projects, and I’m finally on to our Master Bath. At the end of December, I read The Life Changing Magic of Tidying Up by Marie Kondo. I have considered myself someone who does like to throw things away, but will hang on to stuff in case I need it or if it was expensive or a gift, even if I didn’t love it. By the time I finished the book, I was ready to throw away everything I owned- it really is that good! 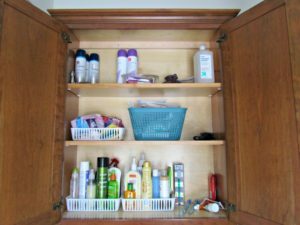 She teaches a method of tidying up that involves discarding and organizing, so you’ll never turn back. Probably the biggest key to her method is to do it all in one shot (aka, over about 6 months). Now that I’m home, now that I’m not having any more babies- I feel completely ready to take this on. Of course, I’ve always wanted to live in a tidy home, but I’ve never been able to keep up with it. Now, I feel empowered and confident that this is going to be it. I’m so glad the universe brought me to this book! SO ANYWAY- the book is awesome, if you haven’t read it and you feel like you struggle with clutter at all (probably 99% of the population), you should check it out. 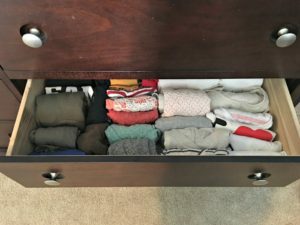 I followed the KonMari method, and started with tidying up my clothes first. I was on a big high, and in one fail swoop, I discarded tons and sorted the rest. Over a month later, and everything I have thus far Konmari’d has stayed that way! Whoop Whoop. Here is what my drawers look like now. I should have taken before photos… I’m so bad at that. I guess it’s cuz I’m a mom blogger, not a home decor blogger?? Just imagine this being a folded the standard way of stacking, and not sorted by color. I know it’s not much, but I am liking the Konmari method of folding clothes! Now I can see everything, and rolled up this way, nothing wrinkles, it’s a weird sort of magic. 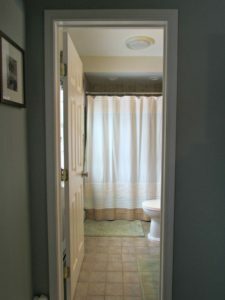 Then, I succumbed to temptation and went off of her procedures a little- I just couldn’t take my master bathroom anymore! So I bought a few different-sized bins at The Dollar Tree, discarded and sorted, and I feel a zillion times better about my bathroom. Gosh I hope there’s nothing embarrassing in here. There was just one problem- the walls were unfinished. It appears that the previous owners removed wallpaper, and stopped there. Luckily, all of the hardware- toilet, sink, shower- all redone. I love it all! But the walls have been rough since day 1 of us living in our house. Honestly, we’ve been so used to it, we hardly noticed it anymore. But when you do notice it… blech. 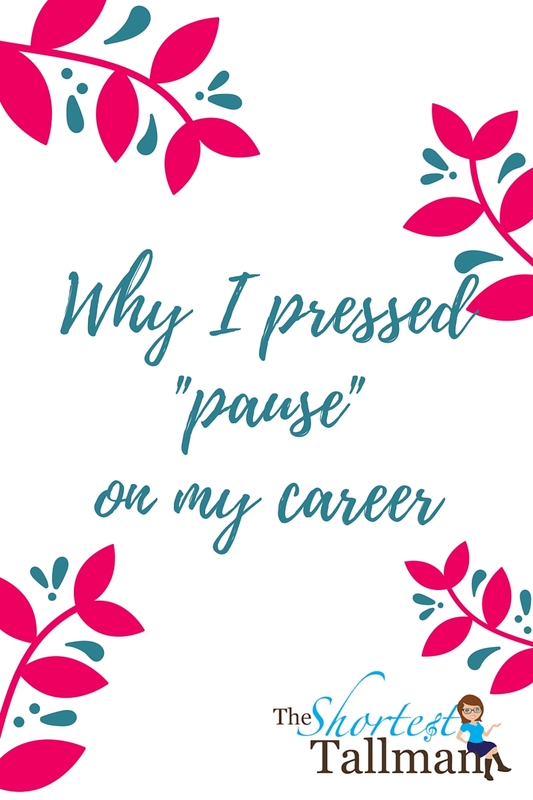 Remember when I told you in this post that my husband sent me a text and told me that a contractor that has worked for the family and business forever was stopping by to finish a project in the basement? I immediately asked if he could also fix up the walls in the bathroom, since I had just worked on my discarding and organizing. He said yes!!! He did a fabulous job- he scraped the remaining glue and put a coat of dry wall cement, sanded it, and primed. Now it’s ready for paint! I went on Pinterest to look up the best Benjamin Moore gray. I have been lusting over so many home décor blogs that have been featuring gorgeous neutrals in gray, and lo and behold, I found “classic gray.” There are some yellow undertoned grout and tile in the bathroom, so I knew I had to make sure the gray jived with that. I ended up going with Classic Grey/1548 from Benjamin Moore, in the Aura Bath And Spa Paint. I painted two coats myself, and it went on perfectly smooth like buttah. Once the paint was up, the window needed some better treatment. Or, any treatment I suppose! We have Levolor cordless blinds, but it needed some sort of curtain. Tiny Tallman and I took a little trek over to Boscov’s to check out their selection… and to inevitably get some chocolate from their candy counter. 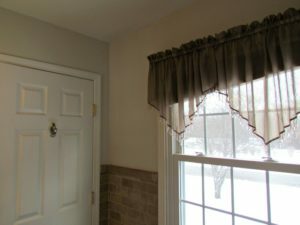 Have you seen Boscov’s inventory of window treatments?! It’s pretty insane. They have a huge selection, nicely displayed, and once you’ve picked out what you want, you go into the self-serve curtain inventory room, where it is all organized. It’s like a library of window treatments, it is awesome. I will definitely be starting there any time I need to buy curtains in the future! 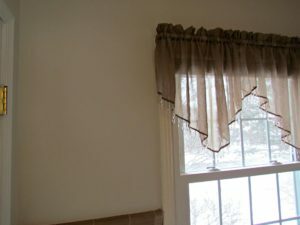 I went with a cute little valance, hung her up, and voila! The Master Bath is complete. 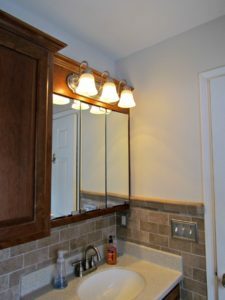 Luckily, no fixtures were harmed, nor replaced, in this project. The Tallest Tallman says the curtain looks a little gypsy-ish. As with most home decor choices I make, his opinion goes in one ear and out the other. I don’t tell him how to wire! Sheesh. 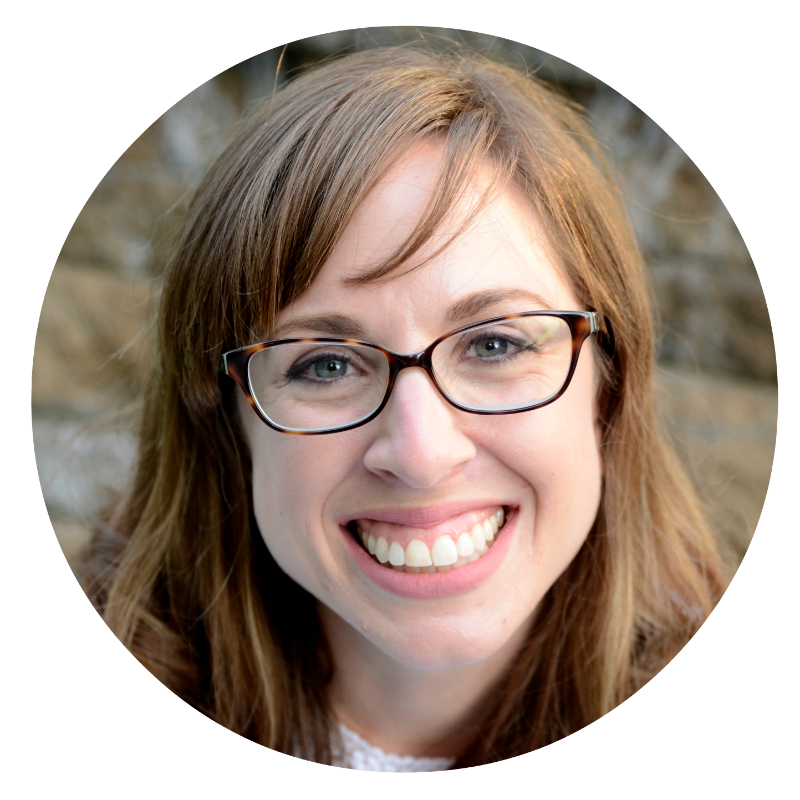 Another great blog Maggi…keep it up!